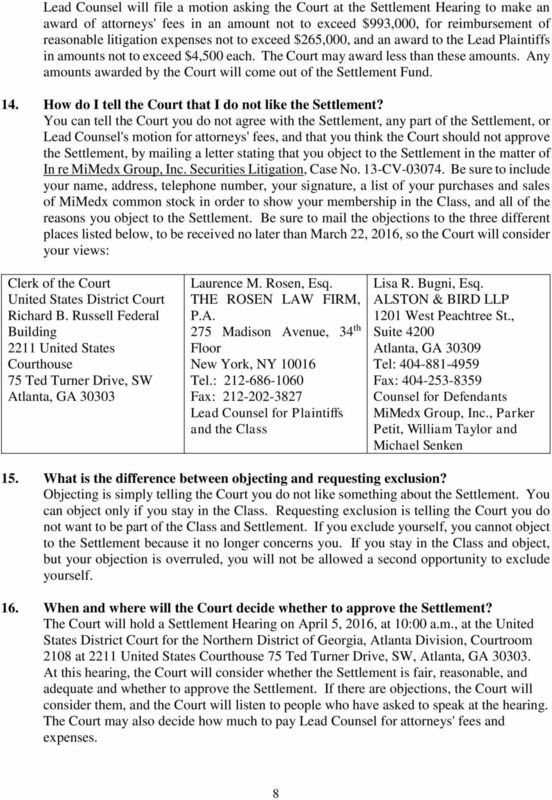 Download "UNITED STATES DISTRICT COURT NORTHERN DISTRICT OF GEORGIA ATLANTA DIVISION NOTICE OF PENDENCY AND SETTLEMENT OF CLASS ACTION"
1 UNITED STATES DISTRICT COURT NORTHERN DISTRICT OF GEORGIA ATLANTA DIVISION In re MiMedx Group, Inc. Securities Litigation Civil Action No 1:13-cv Hon. 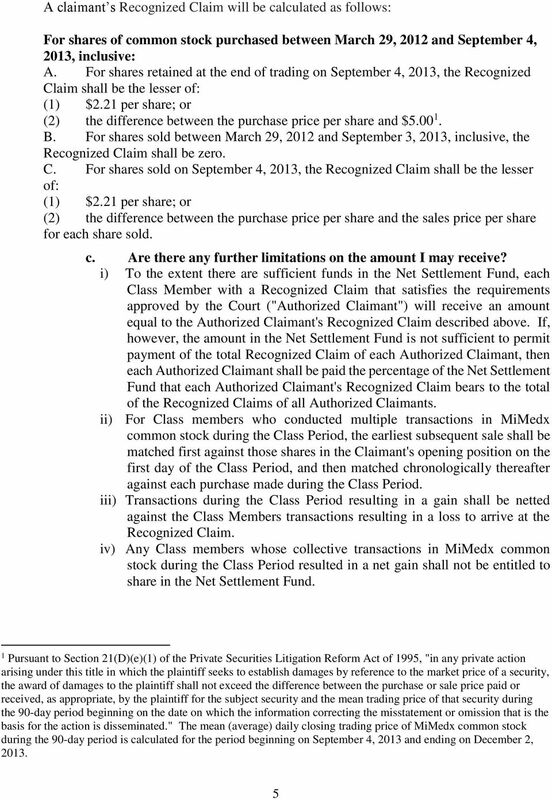 Thomas W. Thrash CLASS ACTION NOTICE OF PENDENCY AND SETTLEMENT OF CLASS ACTION If you purchased or otherwise acquired shares of MiMedx Group, Inc. ( MiMedx or the Company ) common stock during the period from March 29, 2012 through and including September 4, 2013 ( Settlement Class Period ) you could get a payment from a class action settlement (the "Settlement"). 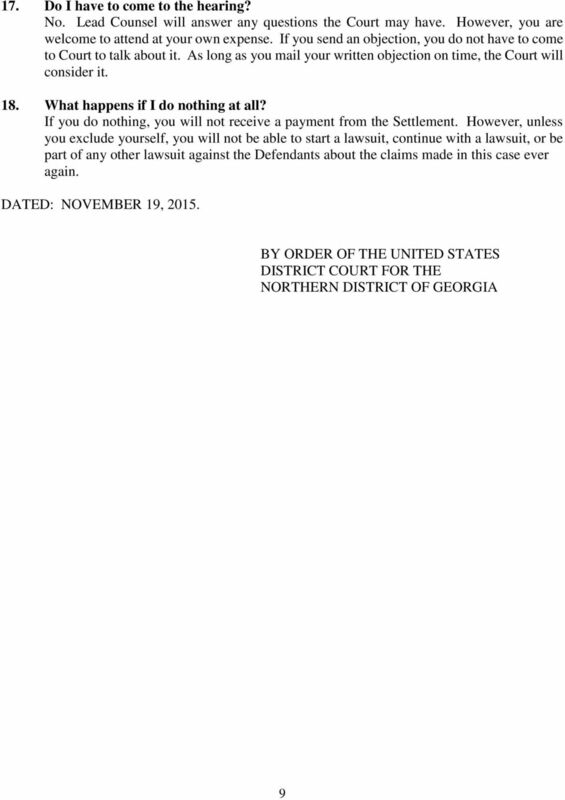 Under law, a federal court has authorized this notice. 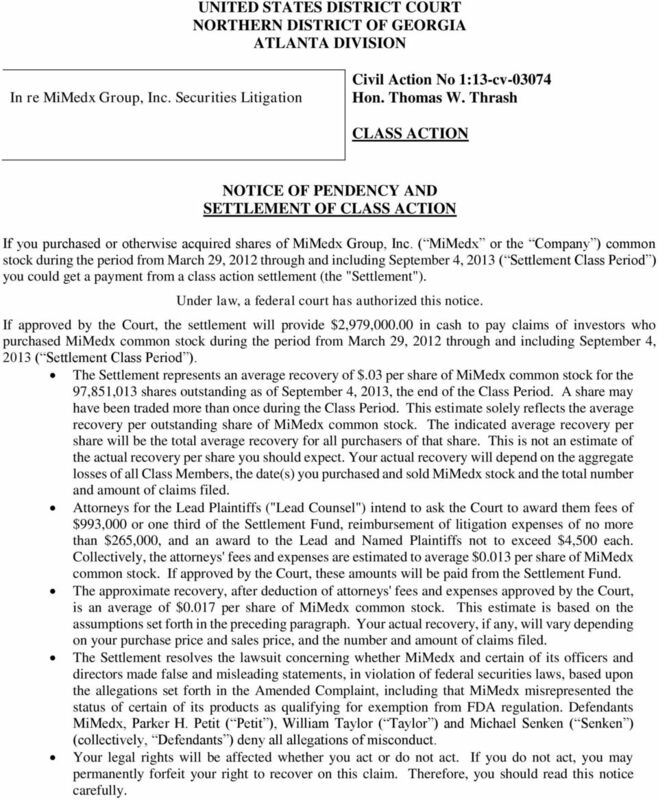 If approved by the Court, the settlement will provide $2,979, in cash to pay claims of investors who purchased MiMedx common stock during the period from March 29, 2012 through and including September 4, 2013 ( Settlement Class Period ). 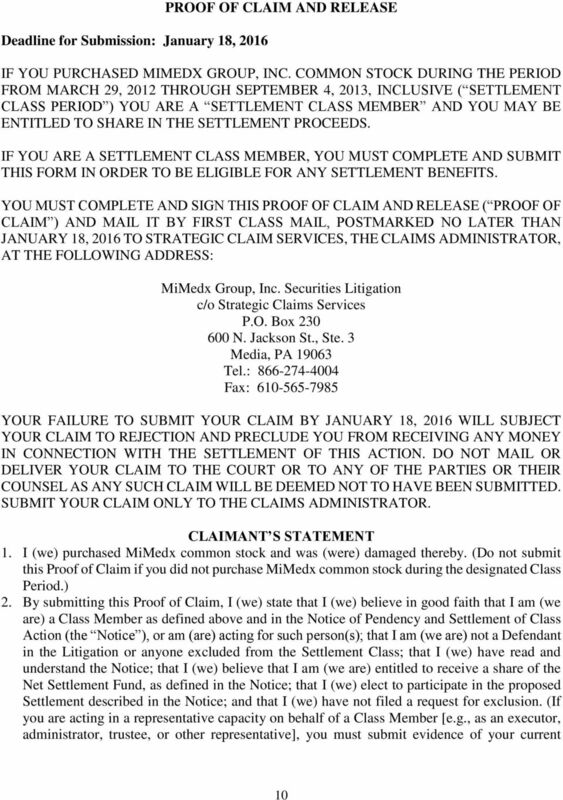 The Settlement represents an average recovery of $.03 per share of MiMedx common stock for the 97,851,013 shares outstanding as of September 4, 2013, the end of the Class Period. A share may have been traded more than once during the Class Period. This estimate solely reflects the average recovery per outstanding share of MiMedx common stock. The indicated average recovery per share will be the total average recovery for all purchasers of that share. This is not an estimate of the actual recovery per share you should expect. 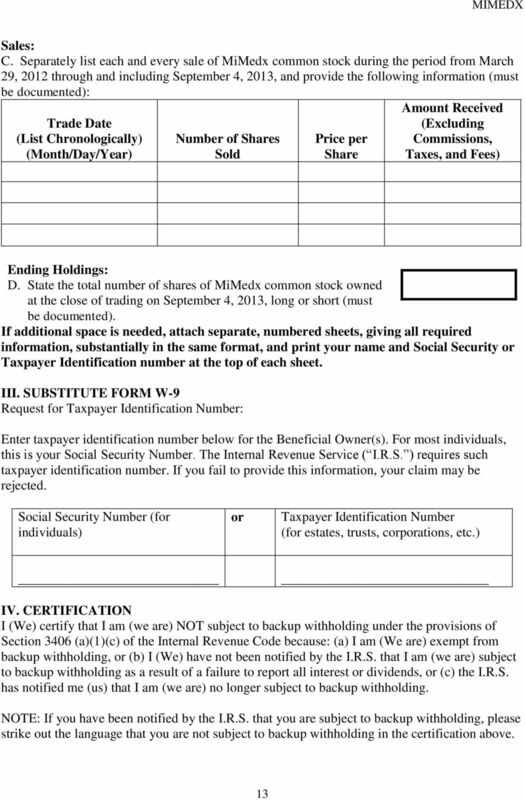 Your actual recovery will depend on the aggregate losses of all Class Members, the date(s) you purchased and sold MiMedx stock and the total number and amount of claims filed. 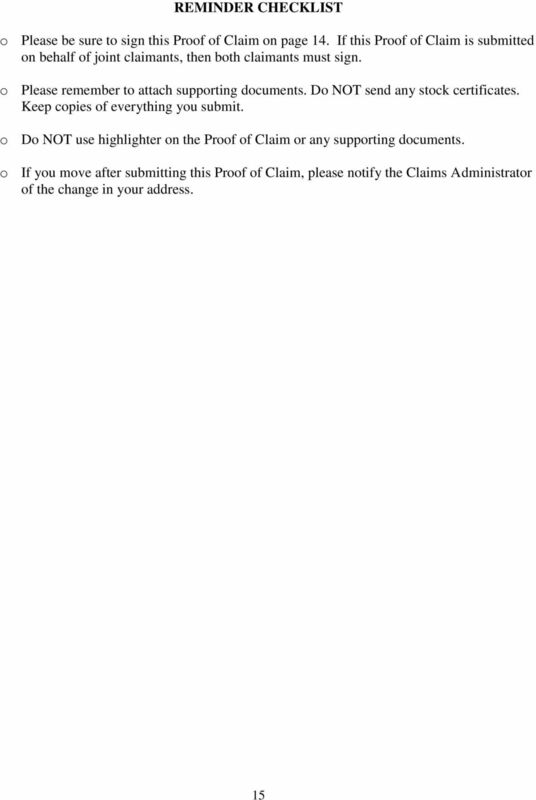 Attorneys for the Lead Plaintiffs ("Lead Counsel") intend to ask the Court to award them fees of $993,000 or one third of the Settlement Fund, reimbursement of litigation expenses of no more than $265,000, and an award to the Lead and Named Plaintiffs not to exceed $4,500 each. 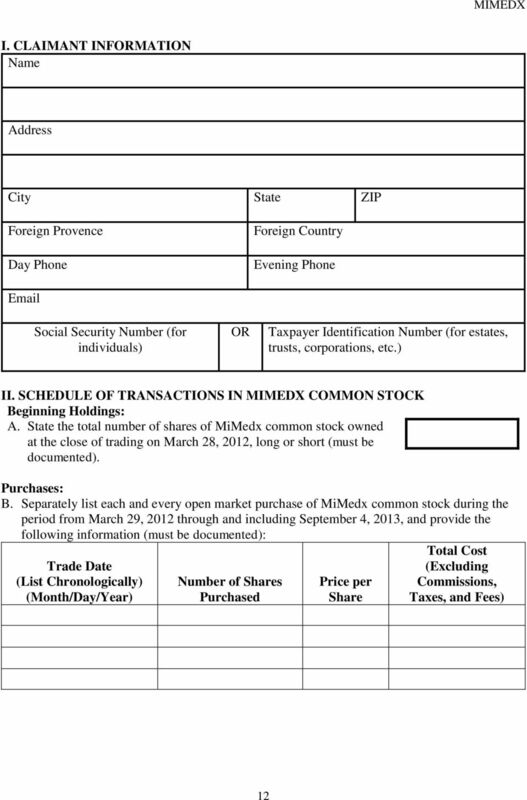 Collectively, the attorneys' fees and expenses are estimated to average $0.013 per share of MiMedx common stock. 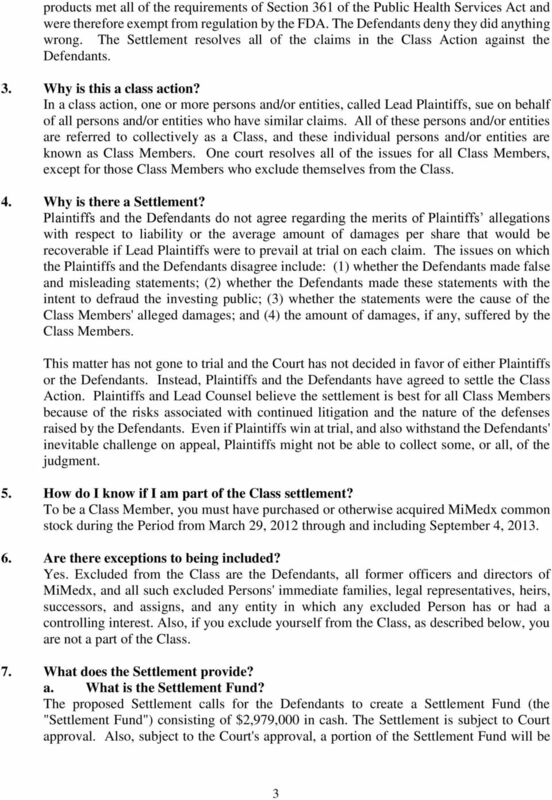 If approved by the Court, these amounts will be paid from the Settlement Fund. 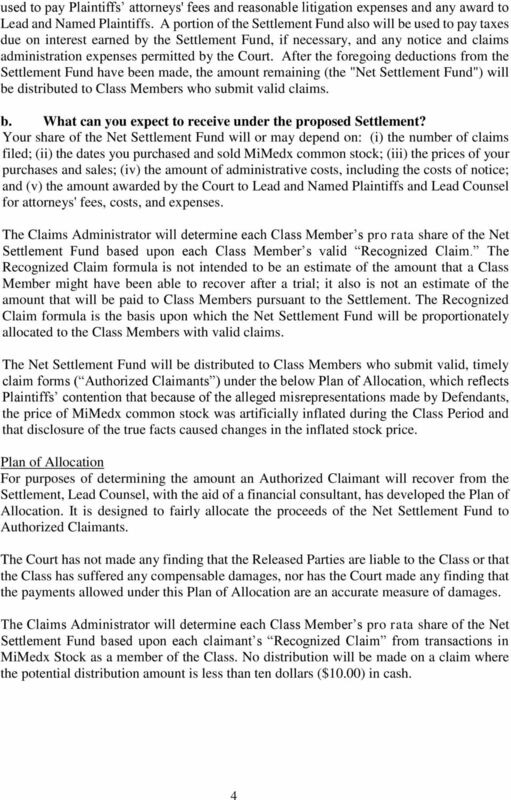 The approximate recovery, after deduction of attorneys' fees and expenses approved by the Court, is an average of $0.017 per share of MiMedx common stock. This estimate is based on the assumptions set forth in the preceding paragraph. Your actual recovery, if any, will vary depending on your purchase price and sales price, and the number and amount of claims filed. 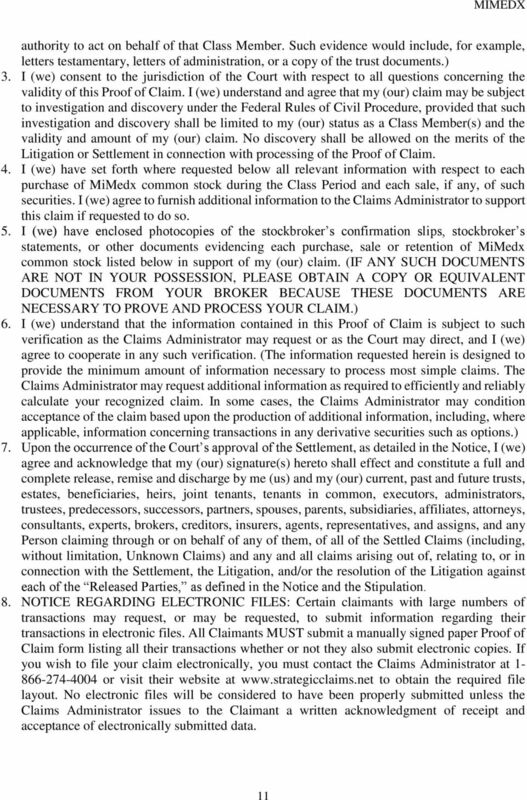 The Settlement resolves the lawsuit concerning whether MiMedx and certain of its officers and directors made false and misleading statements, in violation of federal securities laws, based upon the allegations set forth in the Amended Complaint, including that MiMedx misrepresented the status of certain of its products as qualifying for exemption from FDA regulation. 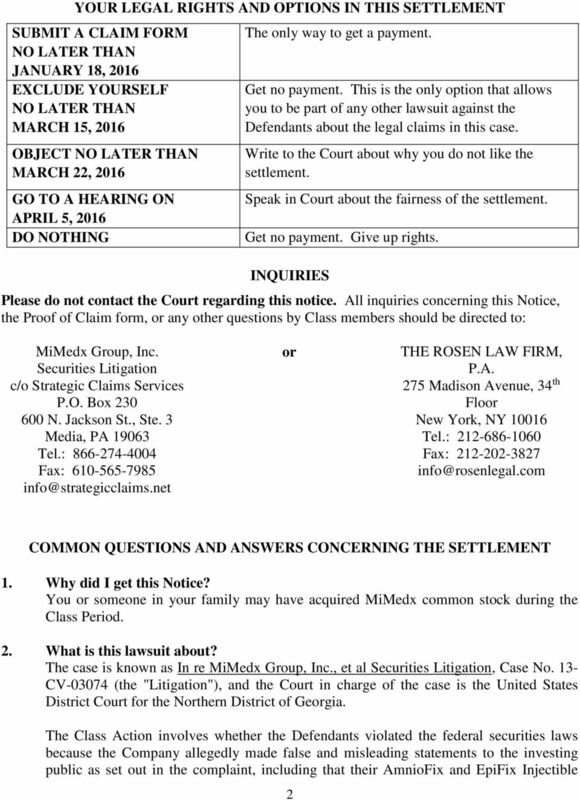 Defendants MiMedx, Parker H. Petit ( Petit ), William Taylor ( Taylor ) and Michael Senken ( Senken ) (collectively, Defendants ) deny all allegations of misconduct. Your legal rights will be affected whether you act or do not act. 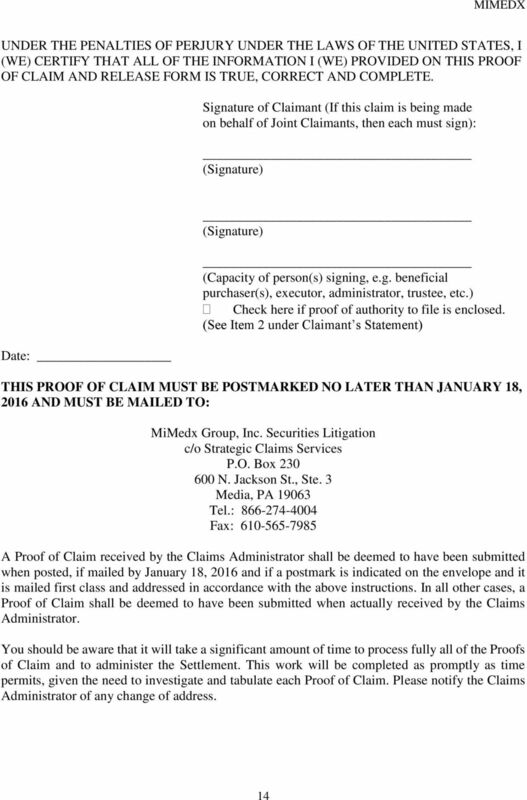 If you do not act, you may permanently forfeit your right to recover on this claim. Therefore, you should read this notice carefully. 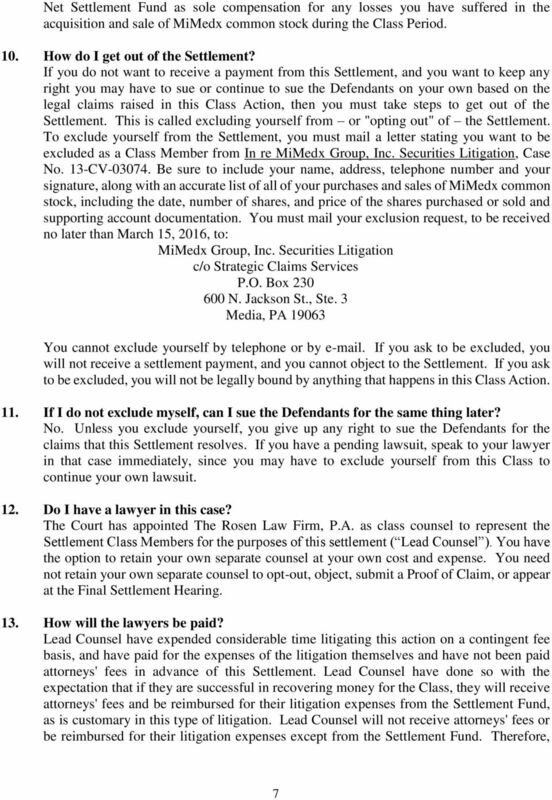 The St. Paul Companies, Inc. Securities Litigation. 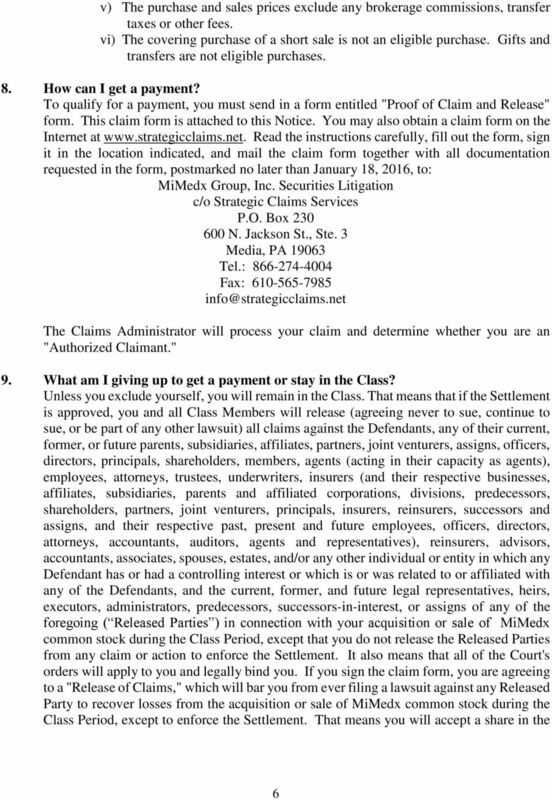 c/o The Garden City Group, Inc.
FAIRFIELD GREENWICH SECURITIES LITIGATION C/O RUST CONSULTING, INC. P.O. BOX 2874 FARIBAULT, MN 55021-8674 IMPORTANT LEGAL MATERIALS UNITED STATES DISTRICT COURT SOUTHERN DISTRICT OF NEW YORK PASHA S.